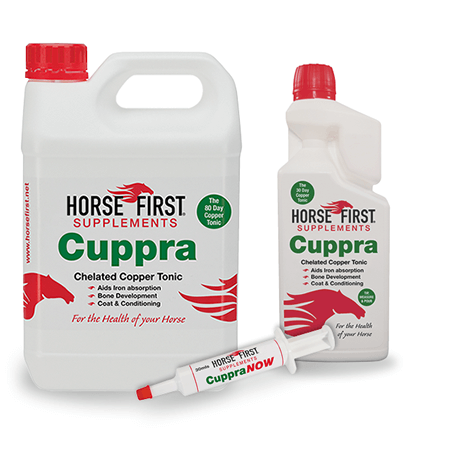 Horse First Cuppra is the ultimate copper top-up, with its high copper availability. Copper has a number of reported health benefits. Vital for the absorption of iron. Essential for broodmares during pregnancy. Important for enzymes involved in the development of connective tissues such as cartilage, tendons and ligaments. One of the most important minerals required for healthy hoof growth. A shortage can lead to abnormal bone development and brittle bones. Give 30mls daily in feed. Do not feed for longer than 30 days, unless on the advice of your vet. Add 30ml to feed daily. Can also be added to drinking water of horses on grass. Copper should be fed for no longer than a thirty day period at any given time.